Take a bowl. 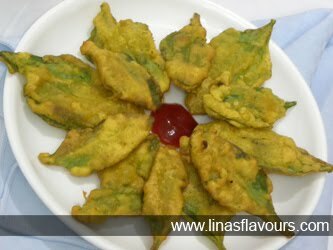 Add besan, salt, chaat masala, cumin powder, red chilly powder, turmeric powder, lemon juice, water and make a batter. Batter should be of pouring consistency. Take a pan and heat oil. Deep spinach leaves in the batter and put it in the oil one by one, 5-6 at a time. Deep fry all the pakoras in batches.